A large group of avocado producers in Michoacan, Mexico, have decided to go on strike because they consider that they are being paid unfair prices for their fruits, and have blamed packers and exporters for this. These producers consider that the sector hasn't taken their claims into account, so they have protested by blocking roads and preventing the passage of trucks with fruit and harvesting personnel. The source of this issue was the decrease in prices experienced by Mexican avocados in the United States market, something that happens every year but that was more serious this year, partly due to the prolonged presence of cheap fruit from Peru in the US market, but also because of the great harvest that Mexico had. Ramon Paz, from APEAM, said he knew that "all avocado producers want to obtain the best possible price for their product, but the current prices are still very profitable for the vast majority." In fact, according to a study of the Local Agricultural Association of Producers of Avocado of Uruapan, production costs range from 10 to 12 pesos per kilogram, while the fruit was being sold from 17 to 19 pesos per kilo in the field." In other words, even when prices have been relatively low, the average producer obtains a profit margin of 7 to 9 pesos per kilo, which is equivalent to 60-90% of their production cost. "These don't seem to be very unfair margins; furthermore, they are very attractive. That's why we can say there is no crisis, but an excess of ambition," said Ramon. 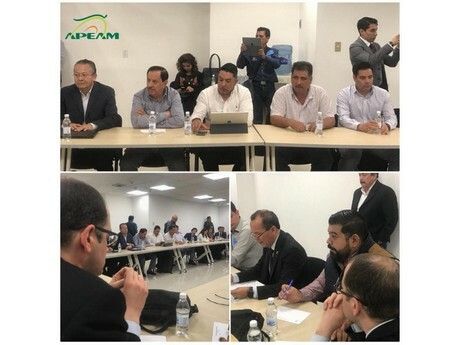 Last Monday, the President of APEAM, Gabriel Villaseñor, and other members of the Board of Directors held a meeting in which the officials of the Federal Competition Commission explained to the producers and officials who accompanied them that it was not possible to set a minimum price or restrict the volumes offered in order to increase prices, as this were illegal practices. Despite this, producers insisted on setting prices, so no agreement was reached. "The Board of Directors of the Association of Avocado Producers, Packers, and Exporters from Mexico held a second meeting with the producer group. The meeting was attended by David Lamb de Valdes, the General Director of Promotion of Competition of the Federal Commission of Economic Competition, (COFECE) "
The APEAM hopes that the strike ends soon and that the government can restore the rule of law, since the effects of the strike have been very serious. Every day, Mexico stops exporting about 3,000 tons of avocado to the USA. Producers are losing 60 million pesos a day, and the packers, harvesters, transporters, etc. another 25 or 30 million. In addition, many jobs have been lost in all the sectors involved. "Customers in the USA are losing their trust in us, which opens opportunities for our competitors, as we've already had to cancel some promotional programs that we had organized for October and November." Ramon Paz stated: "We exported 160,000 tons to the United States up until September 30, and according to our forecasts we'll export a total of 860,000 tons this season. We have an abundant harvest with very good quality fruit so we will have to accelerate the pace to reach our goal in the rest of the campaign. So far we have not canceled the promotions that we have agreed for such important events as SuperBowl or Food Service operators." Teresa Ocaranza, from Aguacates Tinguindin, Mexico, said: "It is affecting everyone in a very direct way. We had to send the staff working in packing to rest and move to the state of Jalisco to continue working. Unfortunately, the chain of people using the avocado is very long, from the juicing industry to the street vendors, and they have been impacted by the lack of work. If you there is no harvest, people don't sell coffees and snacks. The stores do not have the same amount of sales when people are not going to their jobs, and since nobody knows when this will end, people are only buy the essential things. These are people who live on a daily wage and don't know if they'll be able to eat tomorrow if they spend everything today. That's how bad things have gotten. This, of course, includes packers, transporters, and everybody that works with this fruit. Now, all we can do is wait for this problem to be solved."